The notion of 'content' is a bit mysterious to me, but I gather it is meant to be what is represented by a sentence or thought -- some or other proposition, perhaps. When you say, "I agree with what he said," you are affirming the content of the other's utterance. It may also be how we individuate beliefs, i.e. we will say 'they have the same beliefs' just in case their beliefs have the same contents. These contents may be modelled as sets of possible worlds, but this will yield very different results depending on which dimension we use, i.e. whether we settle on primary or secondary intensions. When two distinct people each proudly declares, "I have ten toes," their utterances have the same primary intensions (being true for any world centered on a ten-toed person), but different secondary intensions (being true just in case that very speaker has ten toes). So should we say they have the same content, or not? Both answers seem partly correct - there is a sense in which they believe the same thing, and a sense in which they differ - I guess this is just the distinction between narrow vs. wide content. Here's an argument for wide content: we sometimes talk of beliefs in such a way as presupposes that each has a single, absolute truth value (within a single possible world). If two people believe the same thing, it can't be that one of them is right and the other is wrong. A proposition is either true or false, not true for one person and false for another. Indexicals are explained away on this picture by suggesting that they really contribute different representational content in either case. 'I' in my mouth serves to represent me, whereas your use of 'I' represents you. So we are talking about different things (different people) when we use these words. The content of what we believe/say is not the same after all. Here's an argument for narrow content: we want representational content to capture how we take the world to be - i.e. which possibilities, if actual, would render our belief true. (Frank Jackson talks about 'worlds whose actuality is consistent with the truth of S.' Note that this is different from 'the worlds at which S is true', due to rigid designation and other 2-D quirks.) This is the commonsense notion of content that is introspectable, closely tied to cognitive significance, and otherwise guides our inferences and behaviour. Let 'the D' be the unique associated description by which I identify Paris, i.e. the primary intension of 'Paris'. This description is satisfied by different objects (X1, X2, etc.) in different worlds. Only one of these Xs is actually Paris, but - since I don't know which world I'm actually in - I don't know which one. Now, in believing that Paris is pretty, I distribute my credence over all those worlds where the D is pretty. That's the shaded circle. Note that I do not distribute my credence over all the worlds where Paris, that very object (X1, say), is pretty -- because, firstly, I do not know that Paris is X1, and secondly, I do know that it won't actually come apart from 'the D' that fixes its reference. So my credence is spread over the circle of worlds where the D is pretty, rather than the worlds where X1 (Paris itself) is pretty. So I guess that's Jackson's second argument for descriptivism. Richard, you say: "...'content' is a bit mysterious to me, but I gather it is meant to be what is represented by a sentence or thought..."
Gotta be careful with this. Not everyone conceives of content in representational terms. Some think that content, across the board, has to do with so-called inferential role or something else similarly supervenient on use. Others, like Millikan, who think many ordinary declarative utterances have representational content also believe there are utterances that don't. Millikan says that identity statements do not represent, rather they instruct other cognitive systems how to realign their categories. But now suppose that Paris = x1 and you know this. How do yo now distribute your credence for Paris is pretty? It better be the same way that you distribute your credence for X1 is pretty. Colin - that's curious. Is this a merely terminological difference (using the same word to talk about a different concept), or do they intend for their use of 'content' to better capture the underlying job description -- and if so, what is this job description? 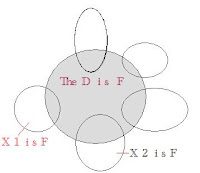 Jack - right, both will be distributed over the intersection of the 'X1 is pretty' and 'the D is pretty' worlds (i.e. the grey-shaded X1 worlds). I'm not too sure where you're going with this, though. Do you agree, in the original case, that credence distribution reveals the belief's content (in some legitimate sense of that word)?